The Brussels Office of the Friedrich-Naumann-Foundation for Freedom together with the European Organisation of Military Associations (EUROMIL) organized the second event of the tripartite series „Overcoming Obstacles on the Way to European Army“ on 31 October 2017. This public debate pursued the question, if and how democratic control mechanisms over armed forces could be transferred from the national to the European level. The “New Model Army” was not a rock band as its title might suggest, but the first ever parliamentary controlled army in the world, designed 1644 by Oliver Cromwell. Today, the British Parliament possesses almost no rights when it comes to deploying armed forces abroad. 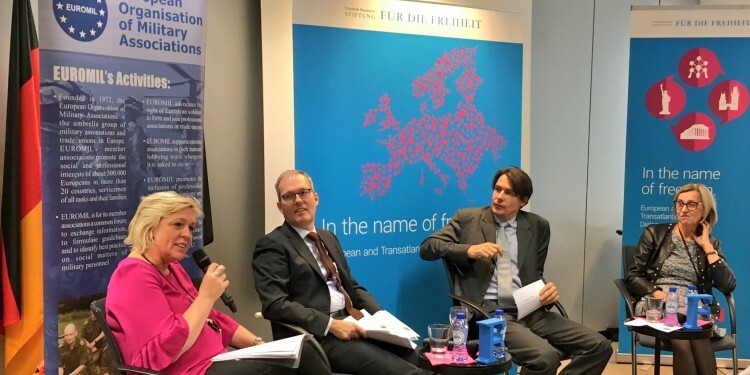 By referring to this ironic development, Kai Küstner (Brussels Correspondent of the German Public Radio Network) opened the debate on the status quo, current problems and potential future solutions. Additionally to parliamentary control, ombudspersons play an important role when it comes to investigating and reporting what actually happens during missions but also at home. As there is no European military ombudsperson (yet), Dr. Martha Hirsch-Ziembínska, Head of the Inquiry Division of the European Ombudsman Office, gave an overview of complaints she receives from civilians and soldiers on current EU missions. She described her competences and underlined that, although she lacks the competence to make binding decisions, her critique and advice are being heard and respected by EU authorities. Hilde Vautmans, Member of the European Parliament and representing the Alliance of Liberals and Democrats for Europe (ALDE) was not shy to make a resolute plea for a European Army, democratically controlled by the European Parliament. The subcommittee for Security and Defence (SEDE) should be upgraded to a fully-fledged committee and the European Commission should include a Commissioner for Defence. Belgian soldiers, according to her, should not wear the Belgian, but the European flag on their shoulders. Politicians should dare to apply a top-down approach when it comes to promoting a European Army. The speakers elaborated their positions further when moderator Kai Küstner interviewed them on tricky aspects like the deployment of the EU battlegroups and the NATO response force. During the subsequent Q&A session with the audience, other questions like the control of weapons of mass destruction were raised. EUROMIL President Emmanuel Jacob closed the debate by summarising that before democratic control can be transferred to a higher level, national parliaments need to work as close with each other as national governments and armed forces already do. He added that coordinating and integrating national armed forces is not only about structures but equally as much about people. PESCO: Step by Step Towards a Final Council Decision!